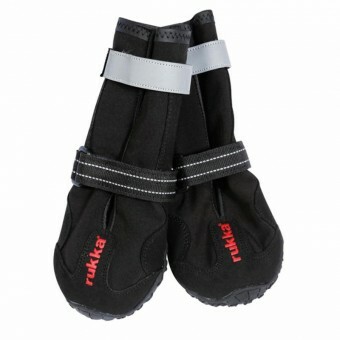 Technical paw wear for heavy use and challenging conditions. Comfortable shoes with an extremely durable, moulded and flexible sole to offer increased flexibility and traction for each step. An elongated shaft provides the dog’s feet with extra protection, for instance, when walking on muddy or snowy ground. Thanks to the touch-fastening straps, the shoes are easy to put on and to adjust to the correct size ensuring that they keep water and dirt out and stay on, also in activities of higher intensity. Splash-resistant material to keep cold, mud and moisture out. The shoes have reflective stitching and straps. PLEASE NOTE: Avoid using on slippery ice.